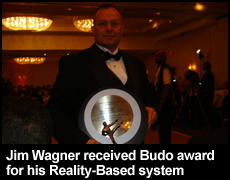 On Saturday, June 17th, Budo International and Maurice Enterprises had their 2nd Annual Gala and Budo International America Hall of Fame 2006 at the Marriott Laguardia Hotel in New York City. The host of the event Maurice Elmalem, a true supporter of me and the Reality-Based Personal Protection system, had me give a 20 minute demonstration on center stage. I taught the audience how to survive a terrorist hand grenade attack, which had the full attention of everyone in the hall. From 9 am to 3 pm I had the opportunity to meet and talk with some of the top martial artists in the world, as well as watch their demonstrations on stage: Actor and fighter Don “the Dragon” Wilson, French police defensive tactics Jacques Levinet, Wing Tsun expert Victor Gutierrez, and Salvatore Oliva from Switzerland. I also had a chance to hang out with William Robbe and Luc Cantara (www.doubleimpactprotection.com) of Canada. 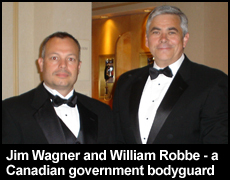 These men work for the Canadian government (a federal agency that I had the privilege of training, but have been asked to withhold the name) as diplomatic bodyguards. William and Luc own their own bodyguard company with their headquarters in Montreal. These men are “the real deal,” and I recommend to anyone in that area to contact them if you are interested in professional bodyguard training. As you may recall, I was a bodyguard for the Dignitary Protection Unit (DPU) of the Orange County Sheriff’s Department (California) from the year 2000 to 2002. I’ve also trained with various protective services from around the world. That evening I, and approximately 300 guests, had a black tie event, dinner and award ceremony at the hotel. My table was packed with some of my old friends: Major Avi Nardia (KAPAP), W.R. Mann (publisher of www.realfighting.com), and Vincent Lyn of the Ling Gar system. Also at my table was Albert Timen (KAPAP) who I had a chance to meet a month prior during a photo shoot at the Black Belt magazine facility in Southern California. The 2nd Annual Budo Gala not only included a great dinner, but plenty of martial arts entertainment: weapons demonstrations, Indian martial arts, young talented fighters, and even an Elvis Presley (1935 – 1977) impersonator and a belly dancer. I was honored to receive an award which read OUTSTANDING ACHIEVEMENT IN THE MARTIAL ARTS FOR REALITY-BASED. The award was presented to me by Maurice Elmalem and John Pellegrini (Combat Hapkido). I also had a chance to see an acquaintance of mine actress/martial artist Cynthia Rothrock. We bumped into each other in the hallway away from the crowd and caught up on each other’s activities. I just recently appeared in one of Cynthia’s newest training DVDs titled Women’s Self-Defense that we filmed in Madrid, Spain with Budo International publisher Alfredo Tucci. 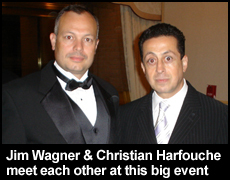 Dr. Christian Harfouche (Chin-na system) came up to me and introduced himself to me. He told me that he admired the direction that I was taking the martial arts with my Reality-Based Personal Protection system, and that he regretted that we didn’t have much time to talk to one another. Both of us were pressed for time, and by the evening things were moving fast. Dr. Harfouche was a really nice guy, and I can see now why he is so liked in the martial arts community. Hopefully in the future we’ll have the opportunity to train with each other. I missed last year’s Gala, but I was happy to have participated in this year’s event. 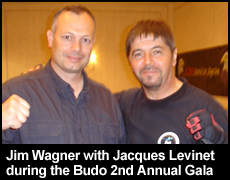 Maurice is always the perfect host, and I wanted to be there to give my support to Budo magazine. Getting an award from them was a nice bonus. From June 19 to 23 I made my yearly trek to New York City to teach my Reality-Based Personal Protection seminar at the Fighthouse run by Peggy Chau. Not only did I have a chance to certify new instructors (Alecks Elia, Derek Fletcher, Christopher Santiago and Serge Cazalet from France), but I had a chance to train with two of my top instructors from past seminars: Elizabeth Greenman (New York City) and Fernando Figueroa (Bronx). As with all of my trips to major world cities, I took a little time out of my schedule to do some research for future Reality-Based DVDs and books that I am working on. This time I visited the WWII aircraft carrier the U.S.S. Intrepid (http://www.intrepidmuseum.org), which is now a war museum anchored on the Hudson River. 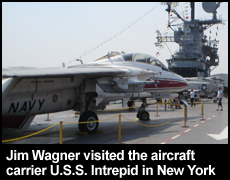 I was very fortunate because The Intrepid Museum will close to the public on October 1st, 2006 to prepare for needed renovations along with the rebuilding of Pier 86. The reconstruction and renovations are expected to take 18 months to complete, leading to a reopening of the museum in May 2008. 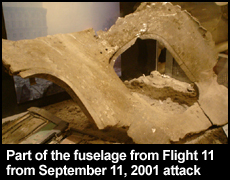 I had a chance to get some excellent digital photos of the aircraft wreckage of American Airlines Flight 11 (the aircraft that was used as a missile to bring down the north tower of the World Trade Center on September 11, 2001). I also took some photographs of Japanese Kamikaze items collected in WWII. My trip to the Big Apple was a huge success, and it is truly one of my favorite cities to visit on my world circuit. 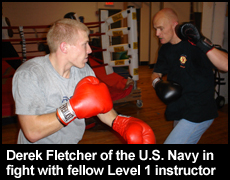 I will be returning to the Fighthouse on December 4 to 8 to teach another Level 1 seminar. To sign up for any, or all five of these courses, go to our online store and click on the courses.